Mika Yamamoto, who worked for the independent Japan Press news agency, was killed Monday during a gunbattle in Aleppo. 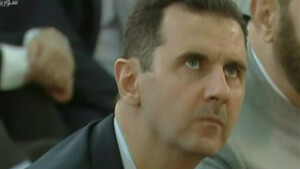 Any suggestions of President Bashar al-Assad resigning could be discussed only after a dialogue with Syrian rebels begins, Deputy Prime Minister Qadri Jamil said Tuesday, according to Russia's state-run RIA Novosti news agency. 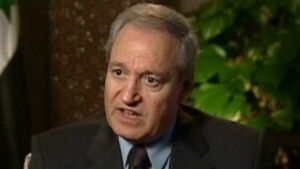 Setting his resignation "as a condition before dialogue means that there will be no dialogue," Jamil said during a visit to Russia, according to the report. 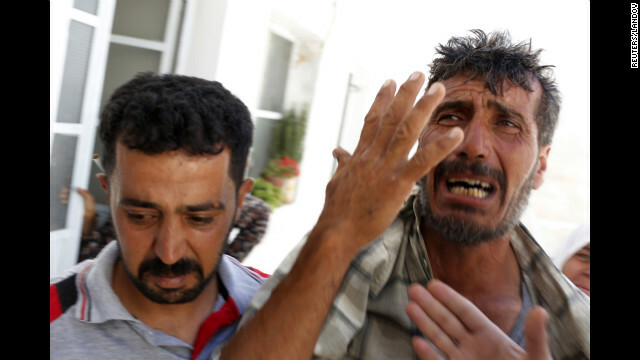 The father of Amar Ali Amero, a Free Syrian Army fighter who was reportedly killed by a sniper in the Salaheddine neighborhood of central Aleppo, mourns during his funeral in Azaz, north of Aleppo, on August 21. 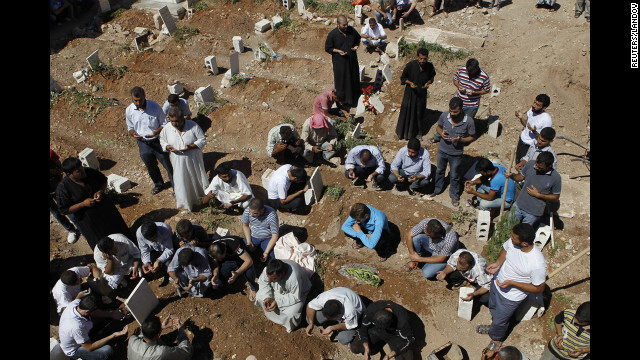 People pray during the funeral of the Free Syrian Army fighter, Amar Ali Amero on August 21. 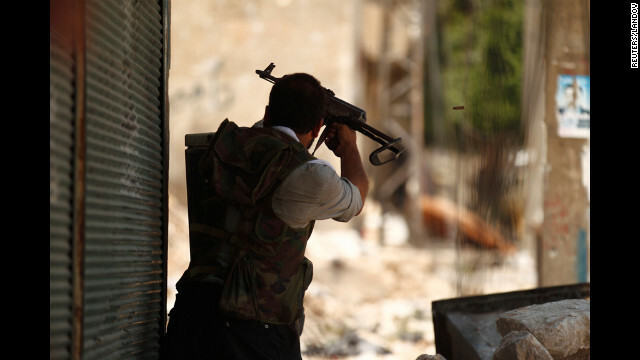 A Member of the Free Syrian Army fires during clashes with Syrian army soldiers in Aleppo's Saif al-Dawla district, on August 20. 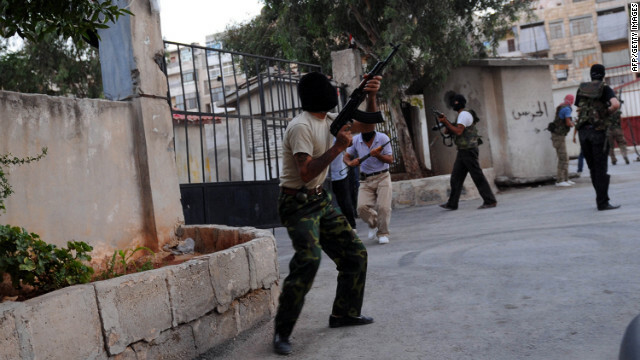 A skirmish in the street of Aleppo's Saif al-Dawla district between members of the Free Syrian Army and Syrian army soldiers on August 20. 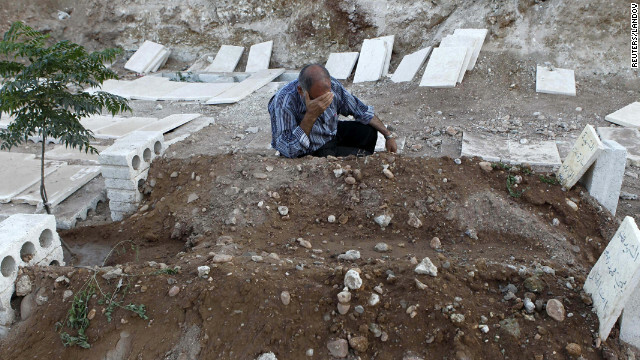 A man cries near the graves of his two children killed during a recent Syrian Air Force air strike in Azaz on August 20. 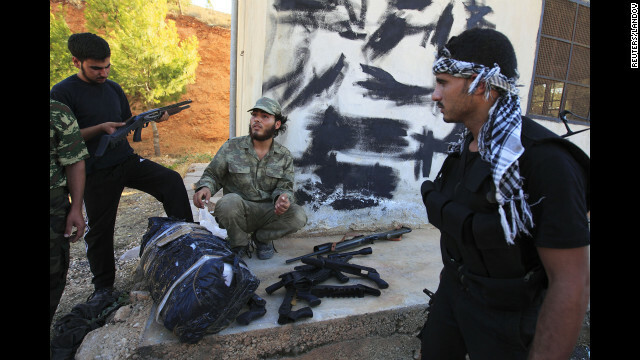 Members of the Free Syrian Army prepare their weapons in Aleppo's Saif al-Dawla district on Monday, August 20. 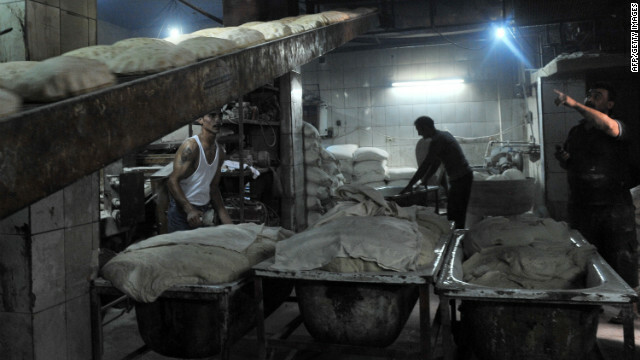 Syrian bakers work in the northern city of Aleppo on Sunday, August 19, the first day of Eid al-Fitr, marking the end of the holy fasting month of Ramadan. 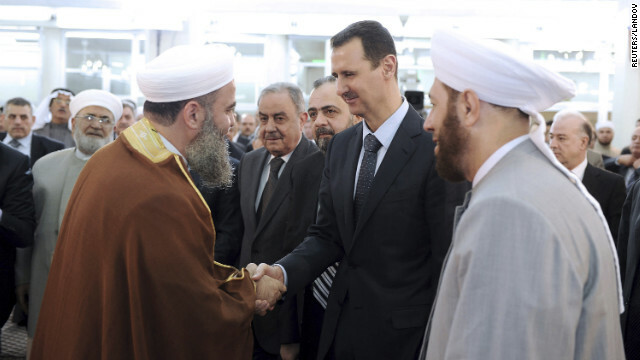 In this image provided by Syria's national news agency, SANA, President Bashar al-Assad, center, is greeted by a cleric while attending Eid al-Fitr prayers at al-Hamad mosque in Damascus on Sunday, August 19. Members of the Free Syrian Army and residents try to extinguish a fire that they say was caused by shelling by forces loyal to al-Assad in the Damascus suburb of Saqba on Friday, August 17. 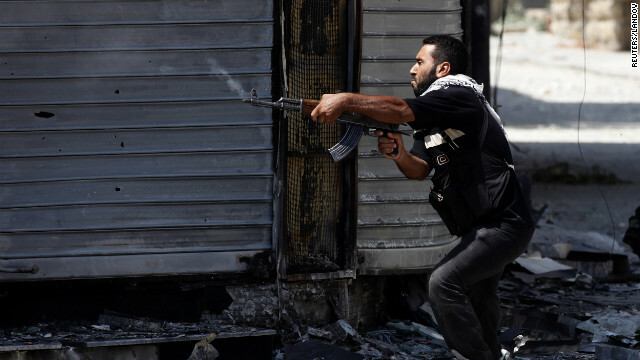 A Free Syrian Army fighter takes aim during clashes in Aleppo on Friday, August 17. 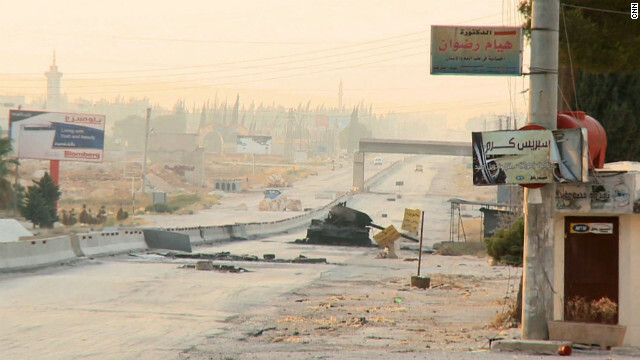 For days, the northern Syrian city has been at the center of some of the worst fighting in the 18-month-old conflict. 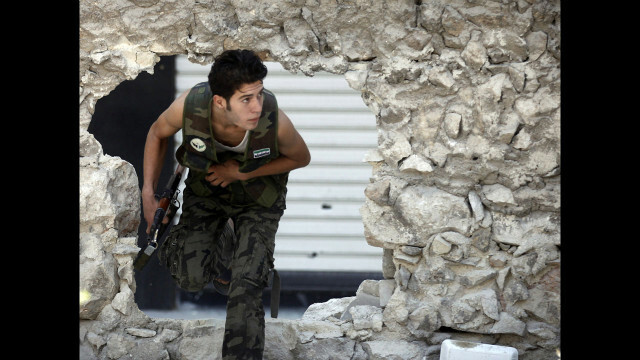 A rebel fighter makes his way through a hole in a wall during fighting Friday in Aleppo, Syria's largest city. 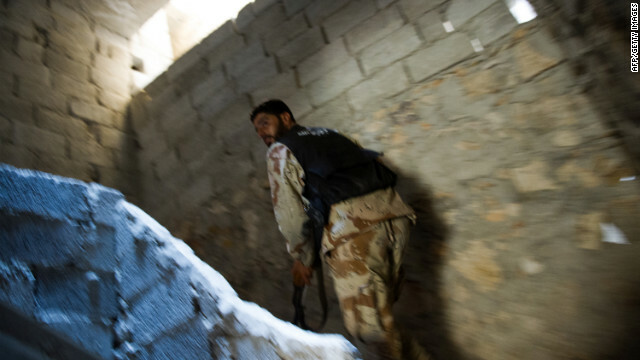 A rebel climbs some stairs in a building during clashes in central Aleppo's Salaheddine neighborhood. A rebel fighter runs for cover as a Syrian army tank shell hits a nearby building Friday in Aleppo. 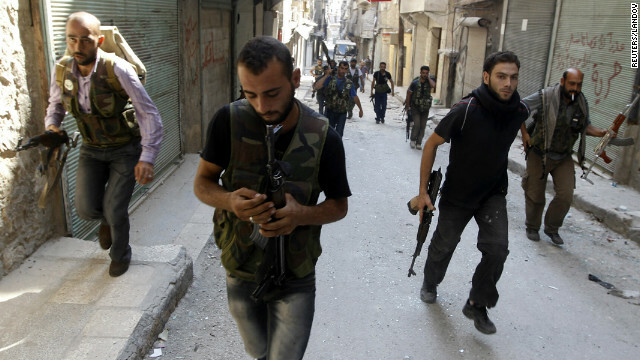 The opposition accuses Syrian forces of shelling flashpoint neighborhoods in Aleppo where rebels are making a stand. 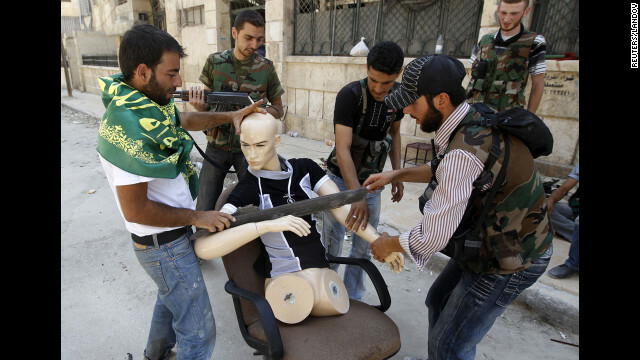 Free Syrian Army fighters dress a mannequin to look like a fighter to draw gunfire away from them Friday in Aleppo. 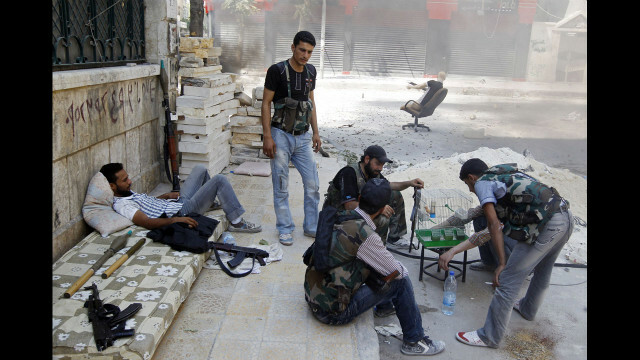 Free Syrian Army fighters rest Friday in Aleppo during a lull in fighting. 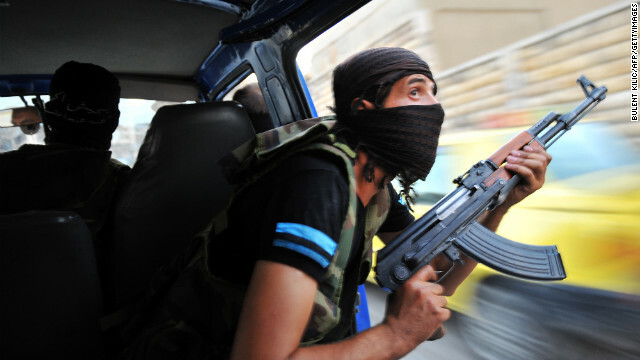 A fighter with the rebel Free Syrian Army secures a street Friday in the Damascus suburb of Saqba. 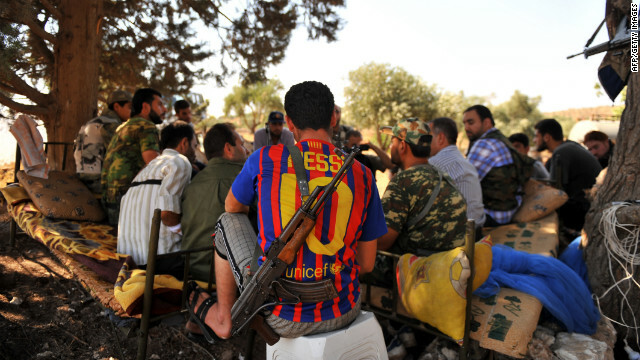 Fighting raged unabated Friday across Syria, while diplomats struggled to find a political solution. 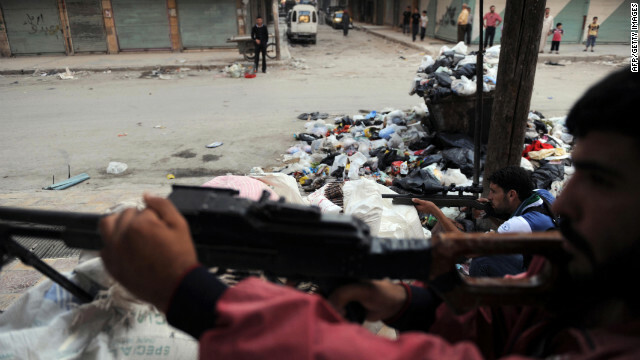 Members of the Free Syrian Army try to secure a street Friday in Saqba. 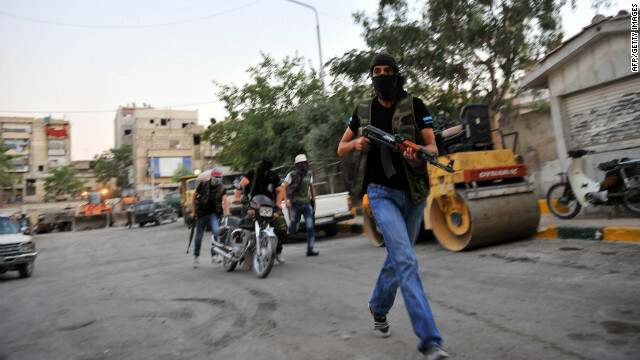 The Free Syrian Army takes charge of a street in Saqba. 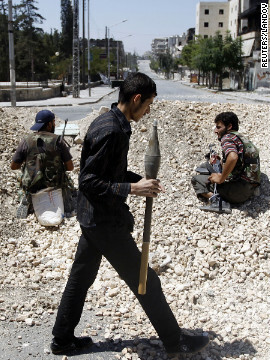 A rebel holds a rocket-propelled grenade Friday in the Damascus suburb. 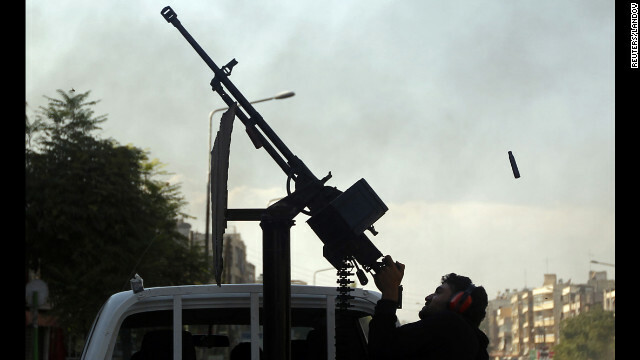 A Free Syrian Army fighter fires an anti-aircraft gun at a Syrian air force helicopter in Aleppo on Thursday, August 16. 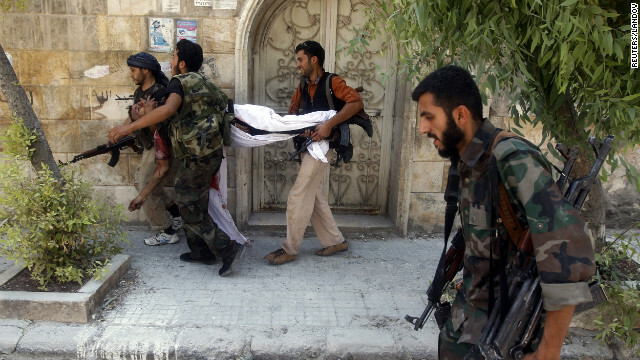 Free Syrian Army fighters carry the body of a fellow fighter during clashes Thursday in Aleppo. 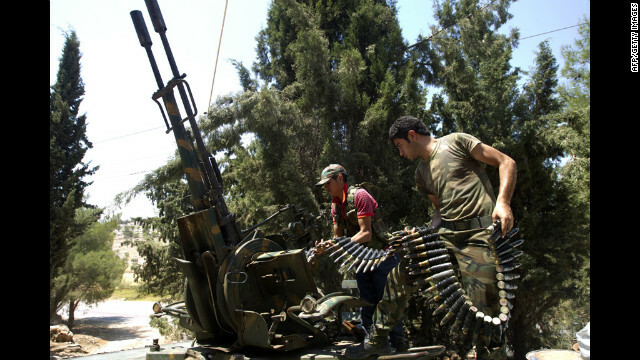 Government forces are pounding Syria's largest city in a siege that's become the focal point of the civil war. 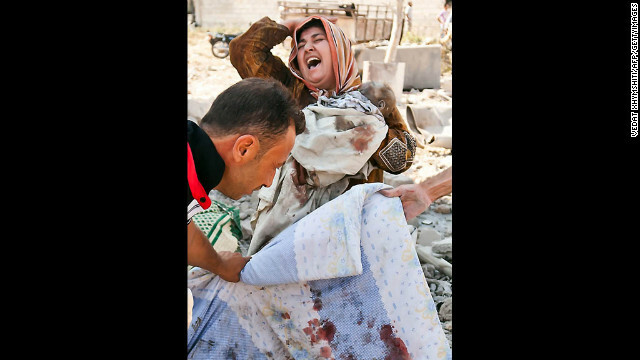 A grief-stricken woman clutches her dead baby while her husband's body is covered up following a regime airstrike on Azaz, a town near Aleppo, on Wednesday, August 15. 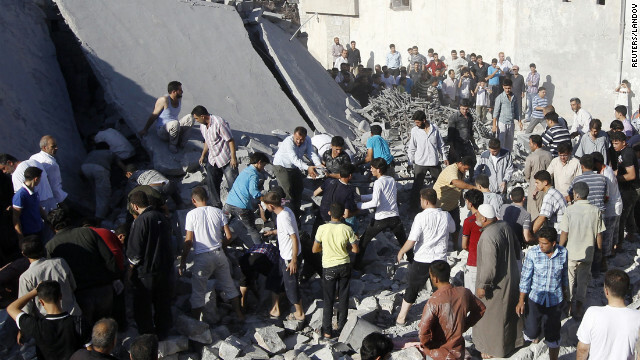 Syrians search for people trapped under the rubble after the airstrike Wednesday in Azaz, near Aleppo. 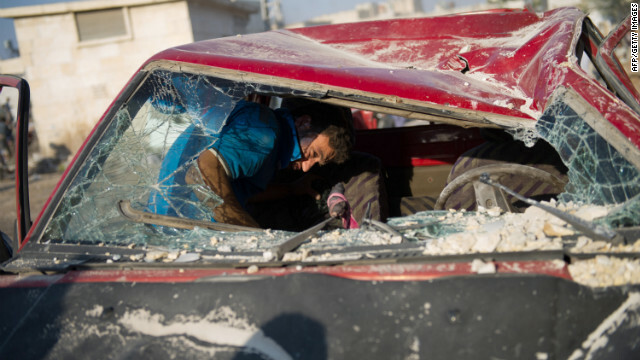 A man removes his belongings from his destroyed car at the airstrike site. 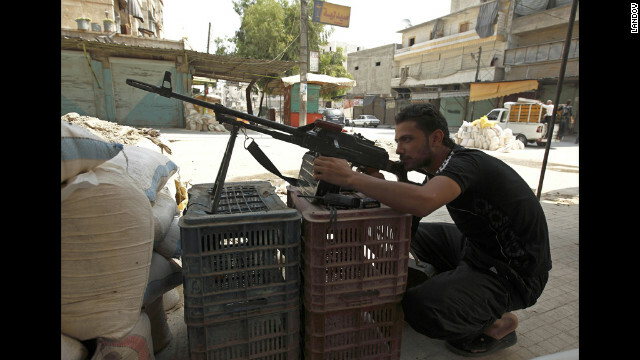 A Free Syrian Army fighter fires an AK-47 rifle in Aleppo on Wednesday, August 15. 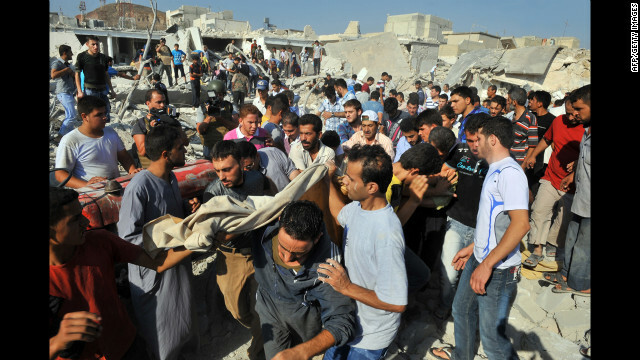 Syrians carry the body of a woman after an airstrike in Azaaz. 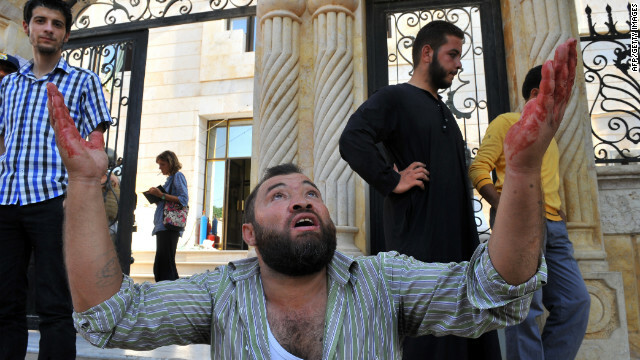 A Syrian man reacts after an airstrike in Azaaz. 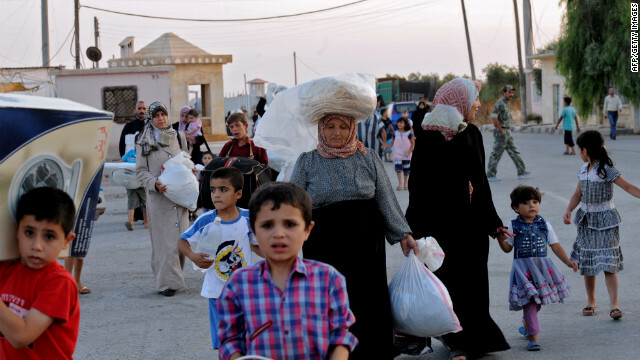 Syrians flee Azaaz following the airstrike. 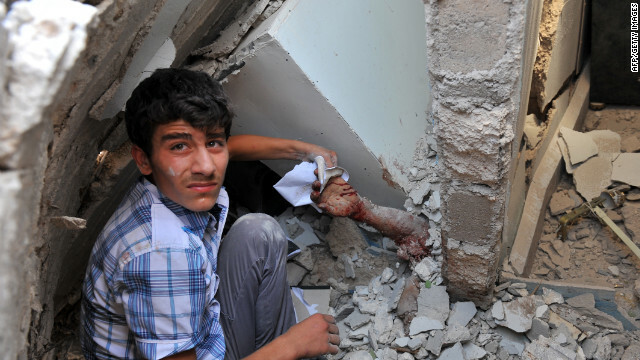 A Syrian youth holds the arm of someone trapped under rubble after an airstrike in the town of Azaaz, on the outskirts of Aleppo. 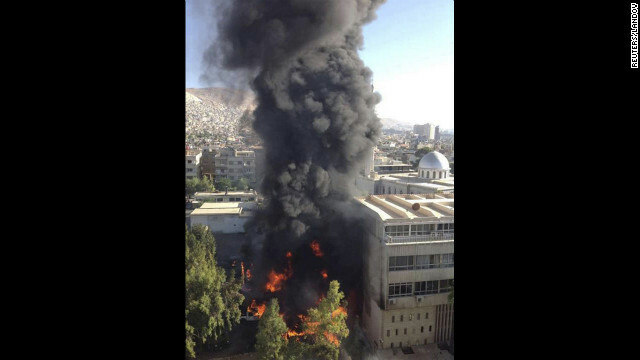 Black smoke billows into the air after a bomb exploded at a military site car park near a hotel used by United Nations monitors in Damascus. 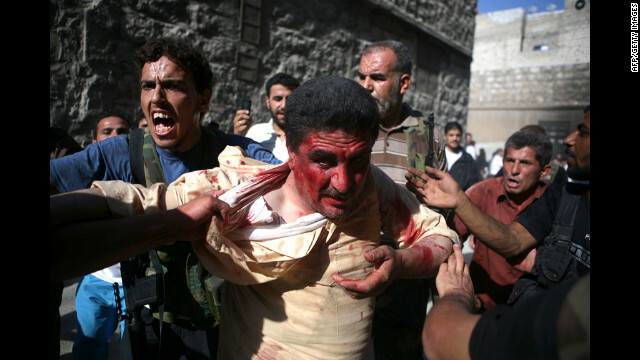 The explosion Wedesday wounded three people, Syrian state television said. 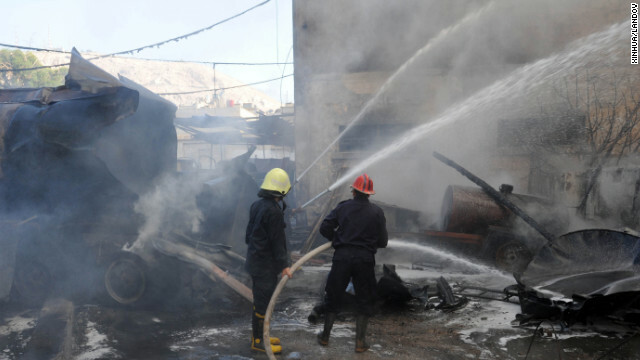 Firefighters work at the scene of a bomb explosion in central Damascus. The bomb was planted under a diesel tanker. 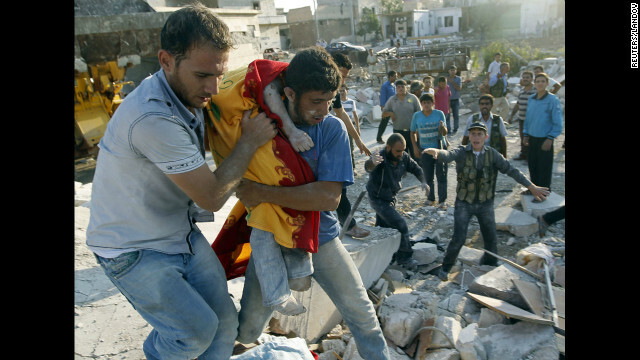 A man carries the body of a boy after a Syrian Air Force strike on Azaz, some 29 miles north of Aleppo. 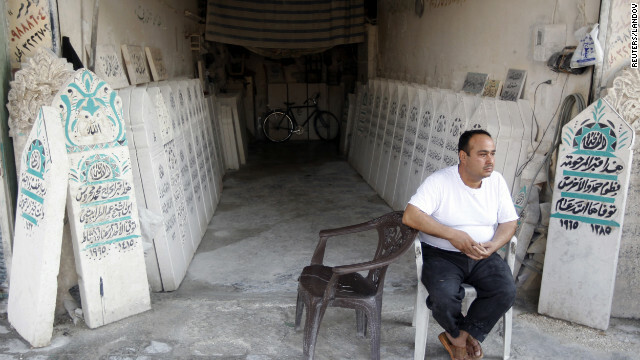 A man sits in front of tombstone workshop in Aleppo. Jordanian security guards patrol the entrance of the Zaatari refugee camp, located outside the northern Mafraq, Jordan, which borders Syria. 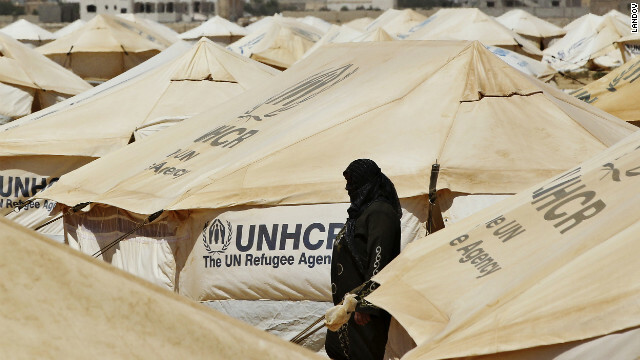 Refugees face the hardships of sweltering heat, dust, lack of electricity and at times sexual harassment in this UN-run desert tent camp. 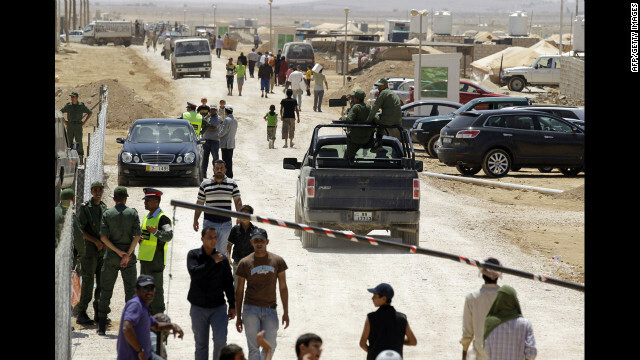 Jordanian security officers detain a Syrian man after he tried to escape from the Zaatari refugee camp in Mafraq. 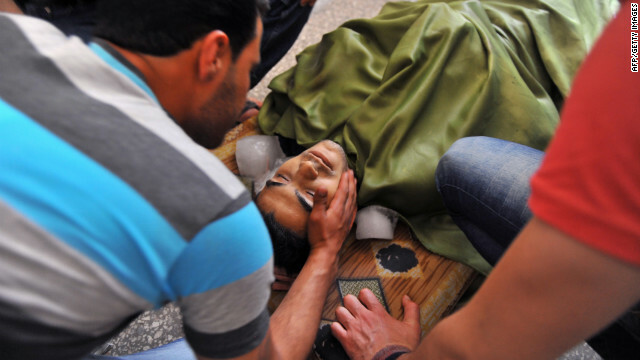 A Free Syrian Army fighter learns that his commander has been killed by a tank shell in Aleppo on Tuesday, August 14. 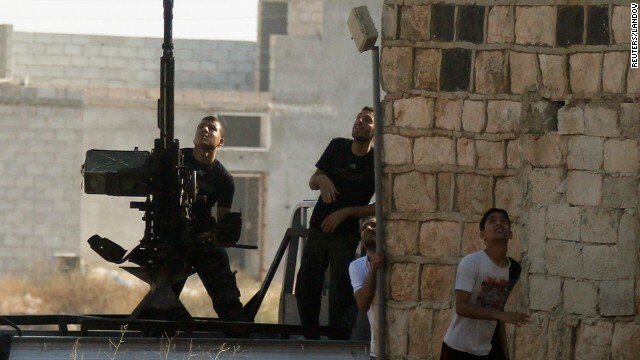 Opposition activists say shelling in dissident strongholds has exacerbated the humanitarian crisis in the country. 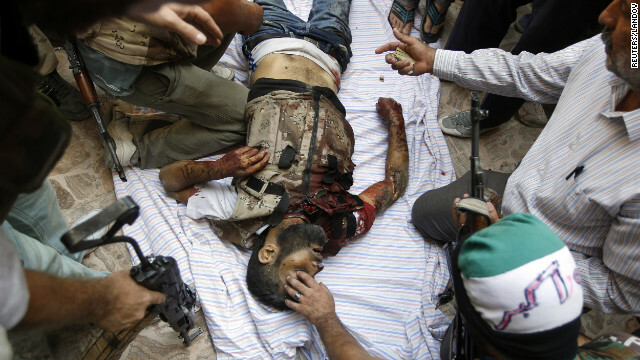 Free Syrian Army fighters look at the body of their commander killed by a tank shell Tuesday in Aleppo. 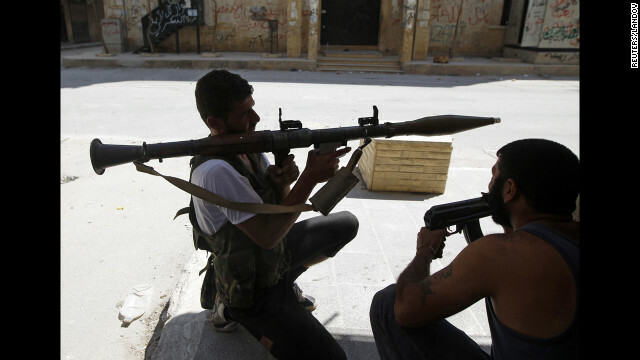 A Free Syrian Army fighter fires his rifle in Aleppo on Tuesday. 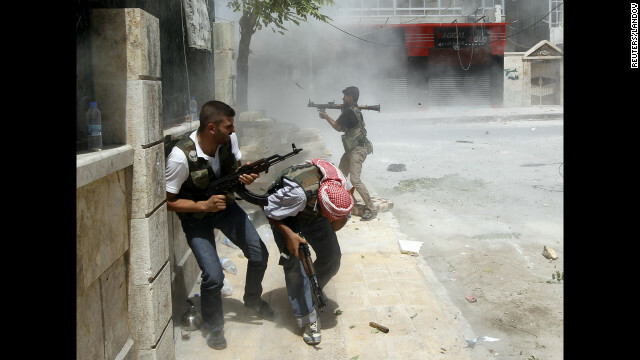 Syrian rebels fire toward a sniper in Aleppo on Monday, August 13, as fighting continues against Syrian government forces. 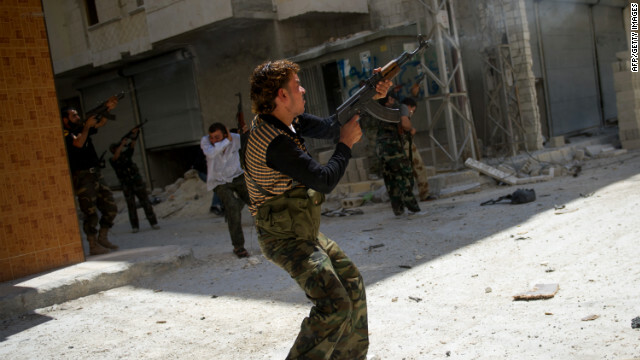 A rebel fighter fires at government forces Monday in Aleppo's Salaheddin neighborhood. 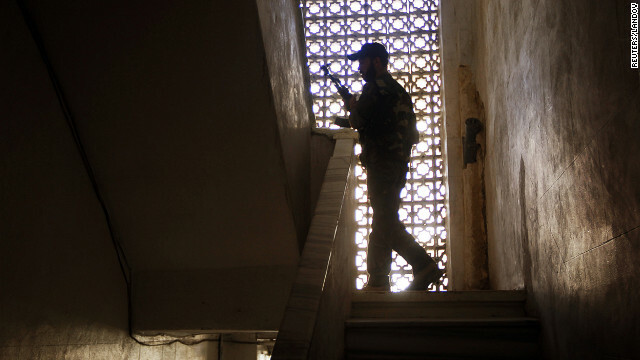 A Syrian rebel climbs a staircase in Aleppo's Salaheddin district as the opposition battles the regime. 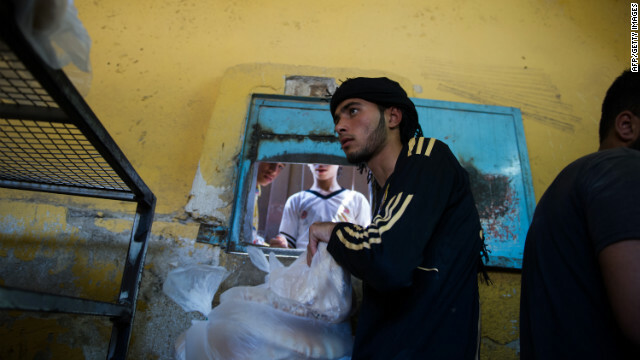 A man gives bags of bread to customers at a bakery run by the opposition Free Syrian Army in Aleppo, Syria's largest city. 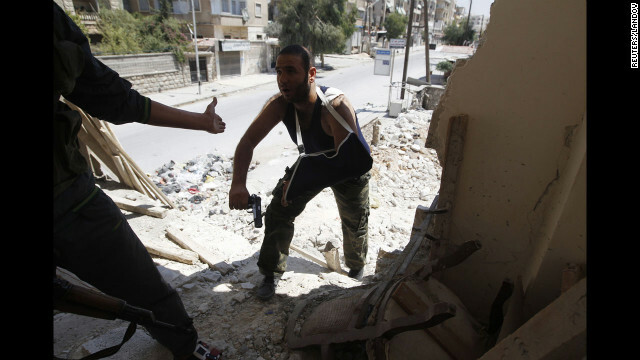 Rebels covered in dust and debris emerge from a building hit by an army tank shell Monday in Aleppo's Salaheddin area. 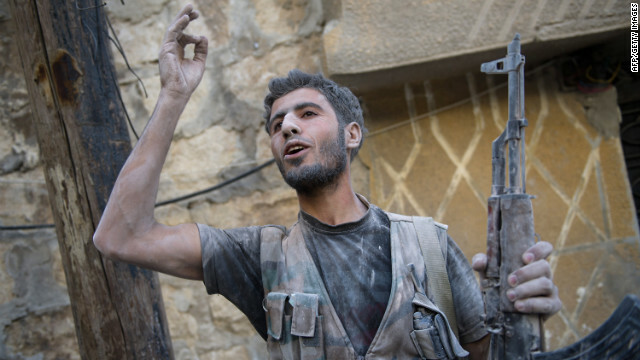 A rebel fighter gestures toward others after emerging from a shelled building during fighting Monday with government forces. 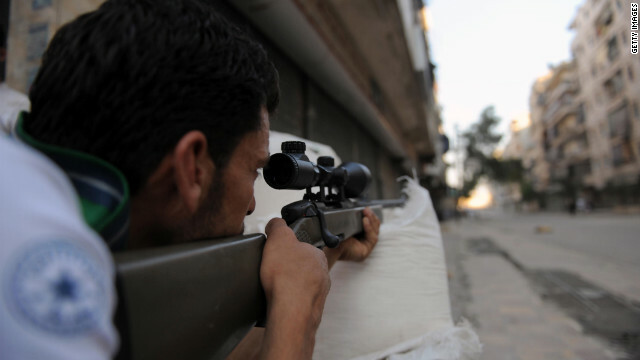 A Free Syrian Army sniper looks through the sight on his rifle from a house in Aleppo on Monday. 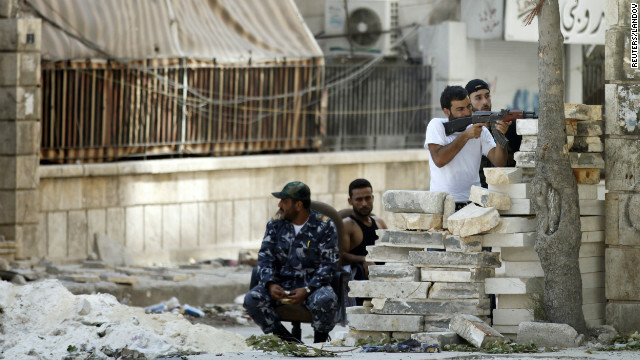 Rebel fighters sit behind a barricade of rocks on an Aleppo street. 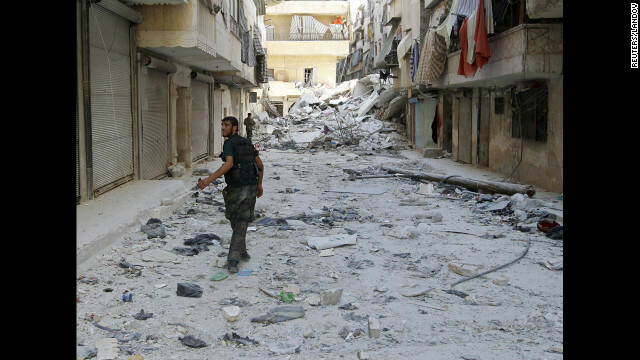 Free Syrian Army fighters walk down a debris-covered street Monday in central Aleppo's Salaheddine neighborhood. A Free Syrian Army fighter fires an RPG as a Syrian army tank shell hits a building across a street during heavy fighting in central Aleppo on Saturday, August 11. 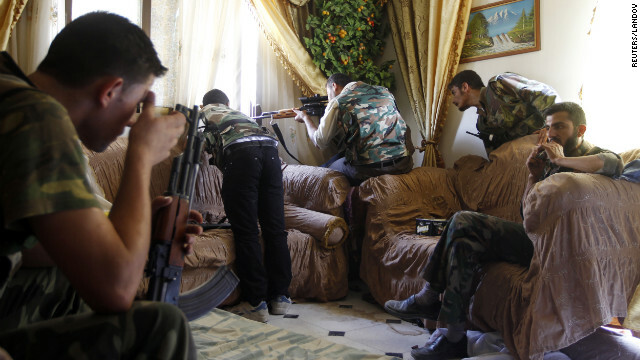 A Free Syrian Army fighter sits on a window sill as he holds an AK-47 rifle in central Aleppo. 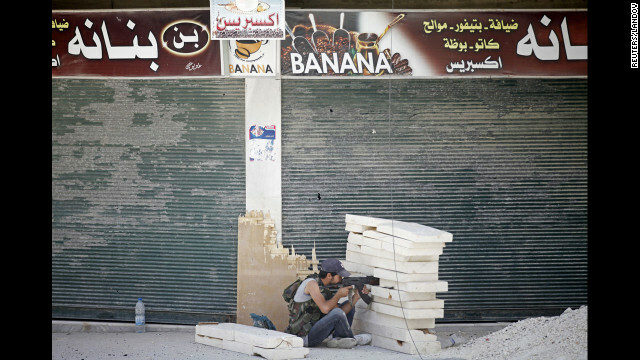 A Free Syrian Army fighter aims his rifle during heavy fighting in the Salaheddine neighborhood. A Free Syrian Army fighter fires an RPG after a Syrian army tank shell hit a building during heavy fighting in the Salaheddine neighborhood. 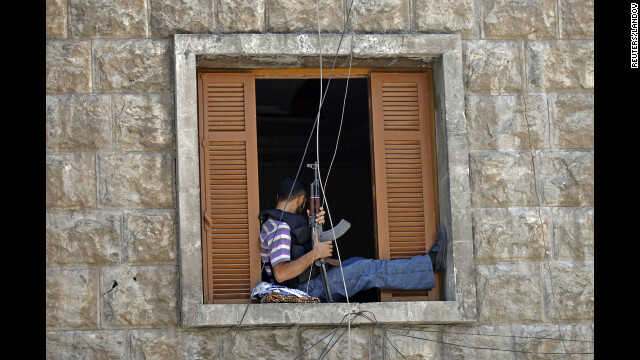 A Free Syrian Army fighter tries to fix his jammed rifle during heavy fighting in the Salaheddine neighborhood. 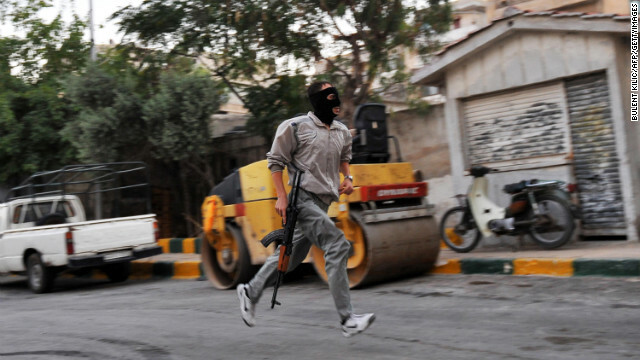 A Free Syrian Army fighter runs for cover during heavy fighting in the Salaheddine neighborhood. 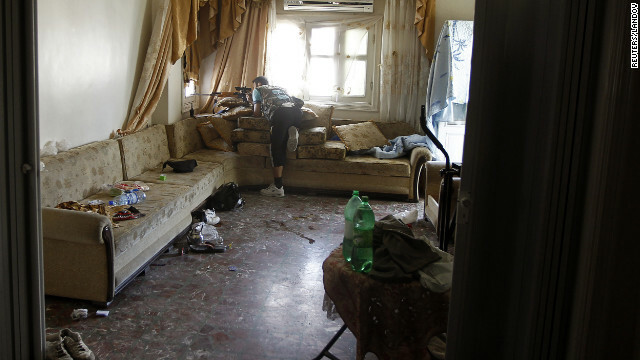 Free Syrian Army fighters walk through a damaged building during heavy fighting in the Salaheddine neighborhood. 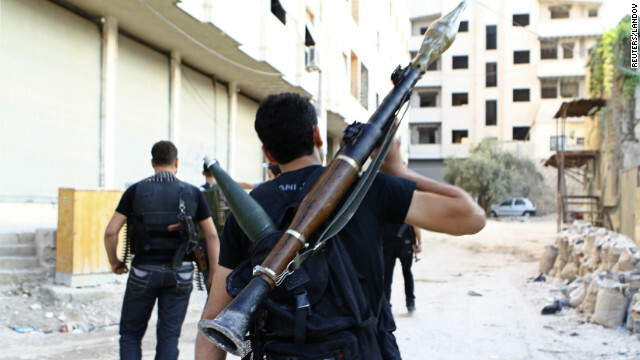 A Free Syrian Army fighter aims an RPG as he waits for Syrian army tanks in the Salaheddine neighborhood. 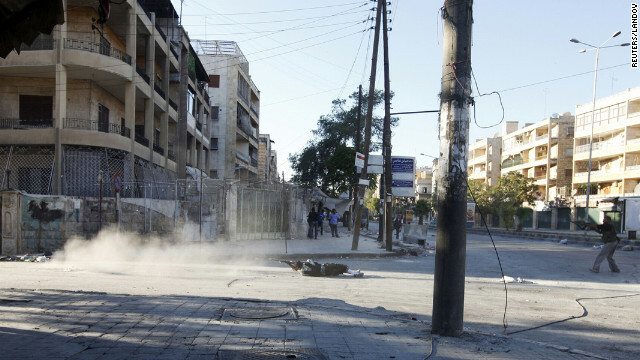 A Free Syrian Army fighter walks on an empty street in the Salaheddine neighborhood. 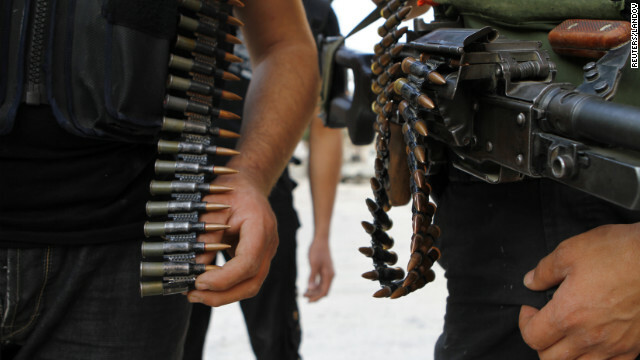 Free Syrian Army members check a confiscated cache of weapons found on a truck that was searched at a checkpoint in Dana. A rebel fighter fires an anti-aircraft gun during a regime airstrike on Tel Rafat, a village north of Aleppo, on Thursday, August 9. The Syrian government and rebel groups have been battling for control of Aleppo, a key front in the conflict that has morphed into a civil war. 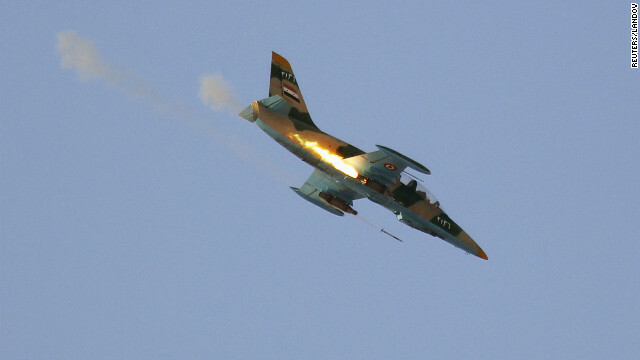 A Syrian air force fighter plane fires during an airstrike Thursday in Tel Rafat, north of Aleppo. 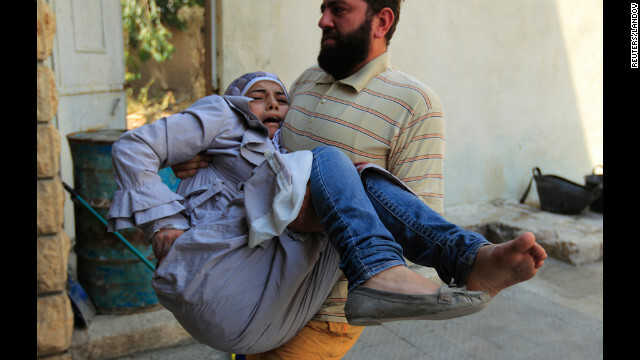 Forces loyal to the regime have been shelling Aleppo, Syria's largest city. 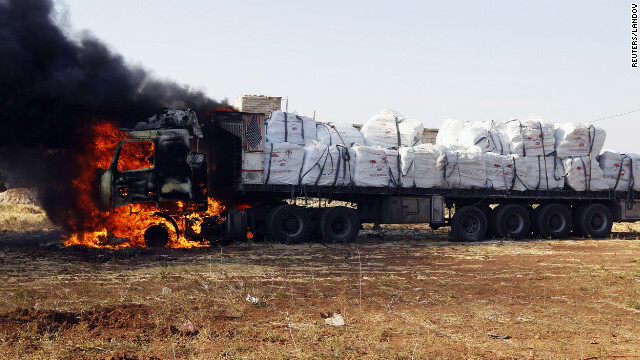 A truck burns after apparently being hit by rockets during an airstrike on Tel Rafat. 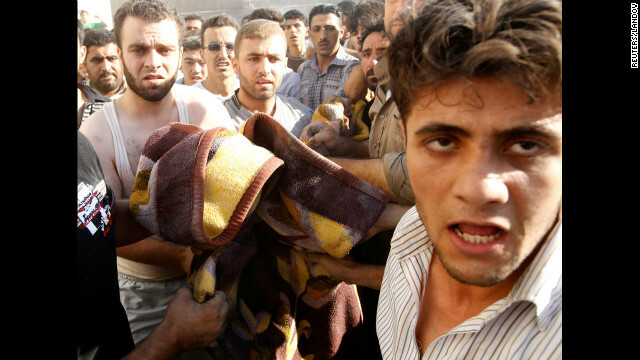 Men carry the body of a boy killed in an airstrike in the village of Tel Rafat. 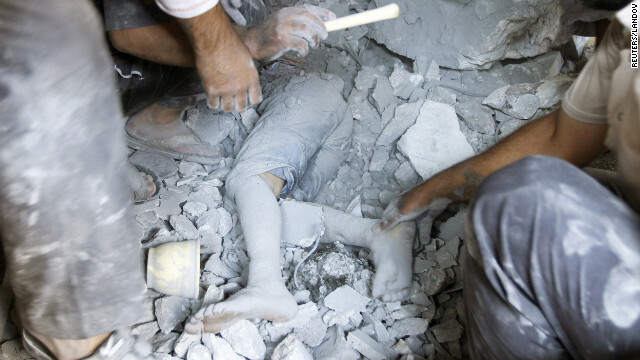 A boy's body is uncovered in the rubble of a house demolished during the recent clashes in Tel Rafat. 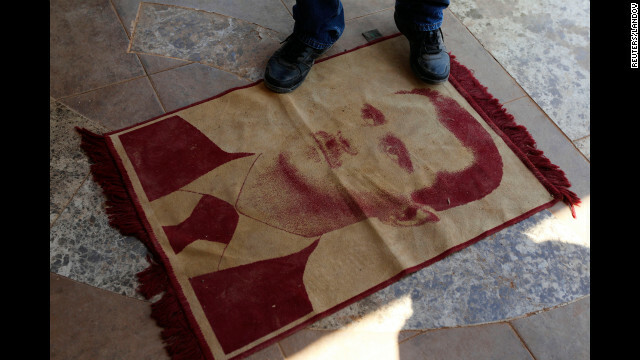 A man steps on a carpeted image of Syrian President Bashar al-Assad in Anadan, northwest of Aleppo, on Wednesday, August 8. 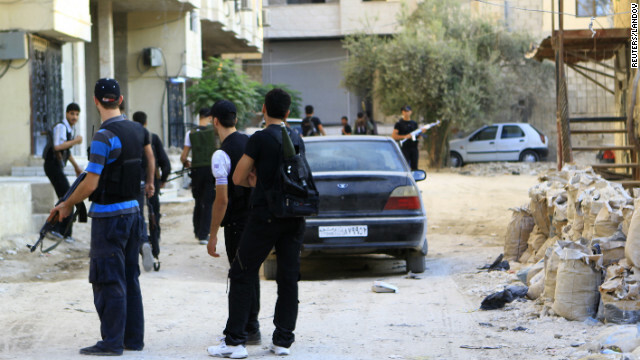 The fighting has taken a toll on al-Assad's regime, which has been hit by assassinations and political and military defections. 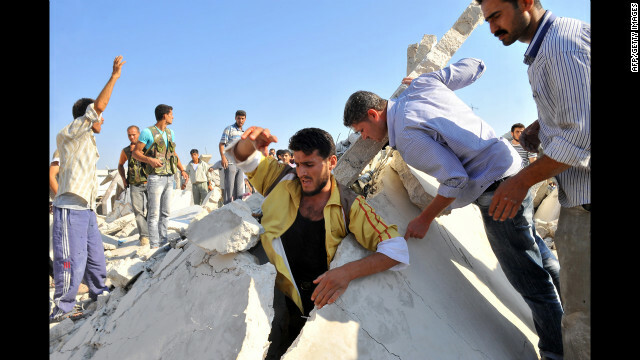 Residents sift through rubble Wednesday searching for bodies under a collapsed house destroyed in an airstrike. Syrian refugees bathe Wednesday at Al Zaatri U.N. camp in the Mafraq, Jordan, near the border with Syria. 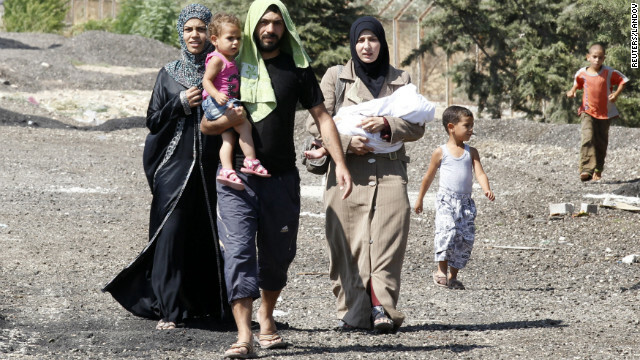 The recent shelling has led thousands of residents to flee Syria. 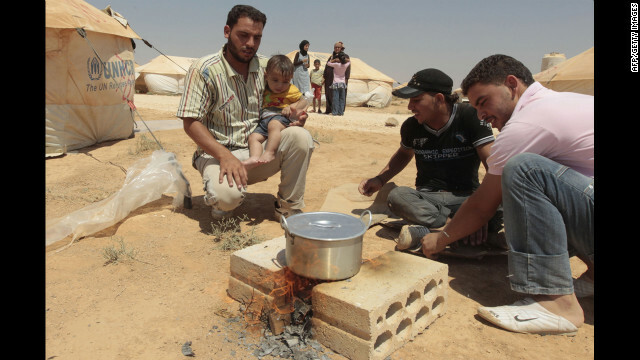 Syrian refugees cook a meal at Al Zaatari camp in Mafraq, Jordan. 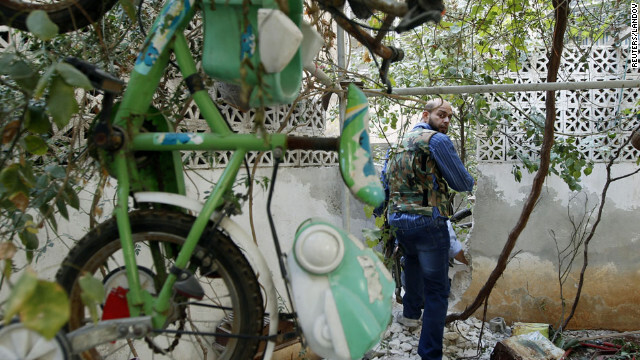 A Syrian rebel prepares his weapon as a group of Free Syrian Army fighters head toward the fighting with Syrian Army soldiers in the Salah ad-Din neighborhood of central Aleppo on Sunday, August 5. 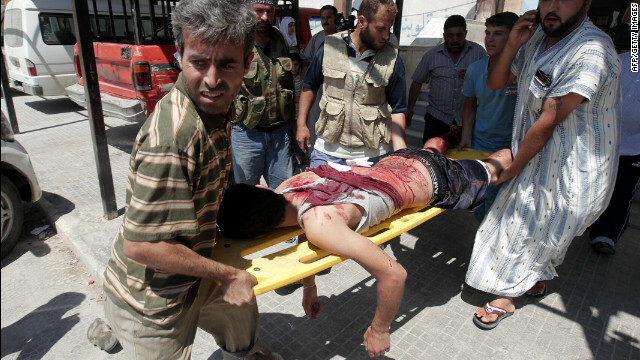 Syrians evacuate a civilian wounded in shelling in the northern city of Aleppo on Saturday, August 4. 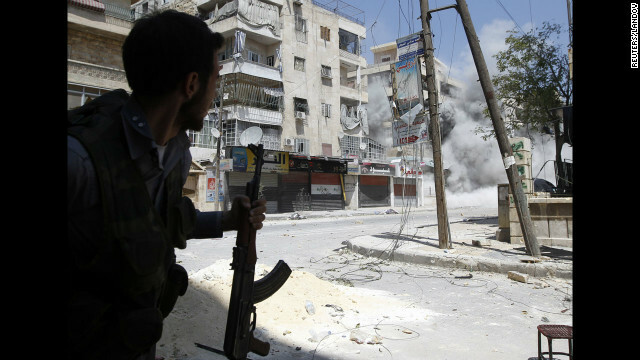 Syria's armed forces pounded Aleppo's rebel-held Salah ad-Din district with air and ground fire as violence also raged in the Shaar and Sukkari districts, according to reporters in the area and a rebel commander. 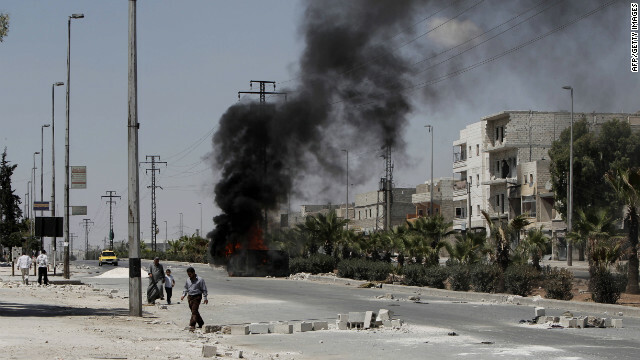 A vehicle burns as Syrians walk through debris from clashes between Syrian armed forces and rebels in the northern city of Aleppo on Saturday, August 4. 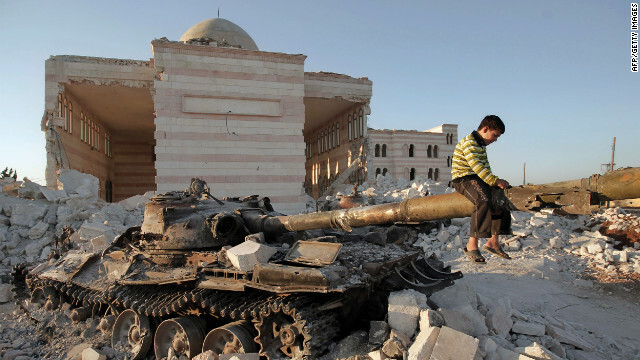 A boy plays on the gun of a destroyed Syrian army tank partially covered in the rubble of the destroyed Azaz mosques, north of the restive city of Aleppo, on Thursday, August 2. 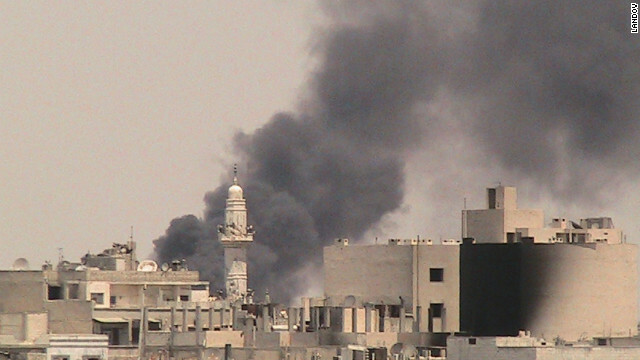 Smoke rises from Al-Safsaf in Homs on Friday, August 3. 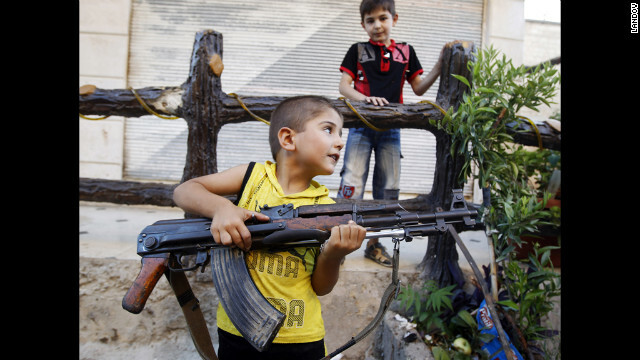 A boy plays with an AK-47 rifle owned by his father in Azaz, some 29 miles north of Aleppo on Friday, August 3. 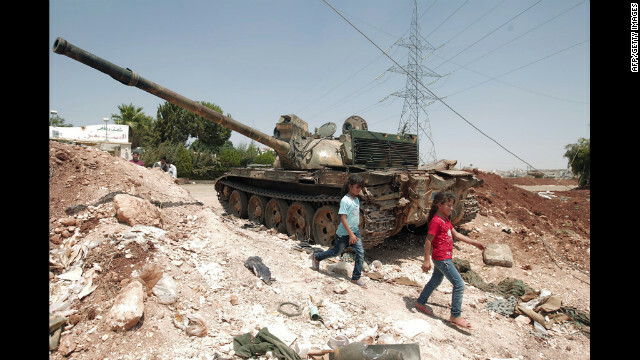 Syrians climb on an abandoned Syrian army tank north of Aleppo on Thursday, August 2. 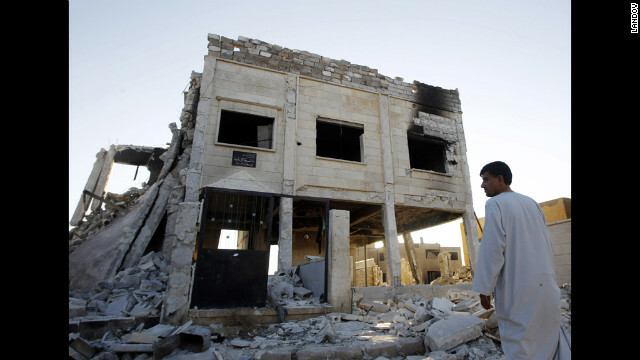 A man looks at a destroyed Syrian army compound in Azaz, 29 miles north of Aleppo on Friday, August 3. A Syrian refugee walks at the Al Zaatri refugee camp in the Jordanian city of Mafraq, near the border with Syria, on Friday, August 3. People and a member of the Free Syrian Army commute on Wednesday, August 1, past a building on the outskirts of Idlib that was hit by rocket fire Tuesday night by forces loyal to President Bashar al-Assad. 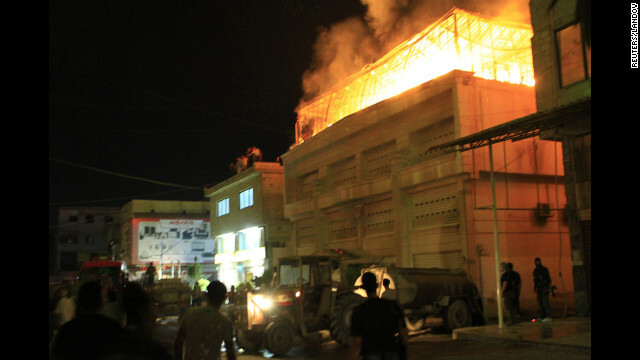 Unrest spread across other volatile regions of the country as al-Assad's forces shelled targets and launched raids in and around Damascus, Homs, Daraa and Deir Ezzor. 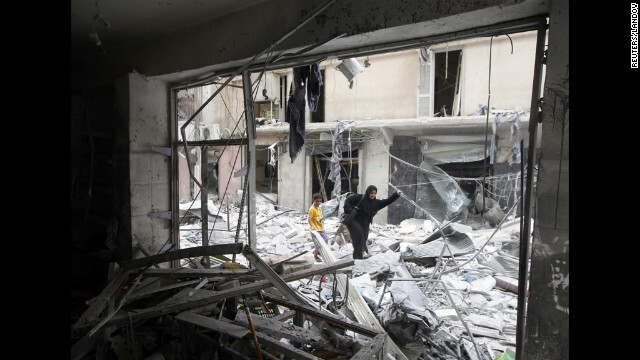 A woman and child on Wednesday walk through rubble of a building destroyed by shelling from forces loyal to Syrian President Bashar al-Assad in Aleppo. 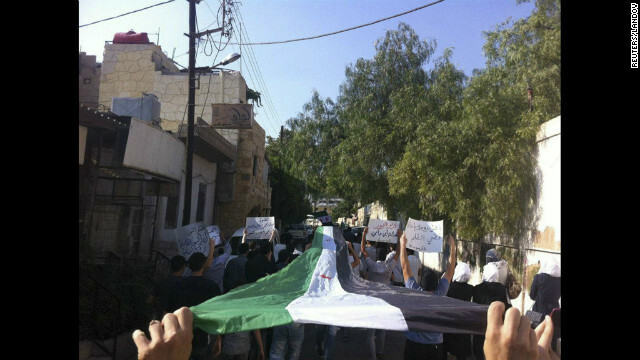 Demonstrators hold an opposition flag during a protest Wednesday against Syria's President Bashar al-Assad in Damascus. Syrian girls on Wednesday walk past a Syrian army tank captured two days earlier by rebel fighters at a checkpoint in the village of Anadan. The strategic checkpoint secures the rebel fighters free movement between the northern city of Aleppo and Turkey. 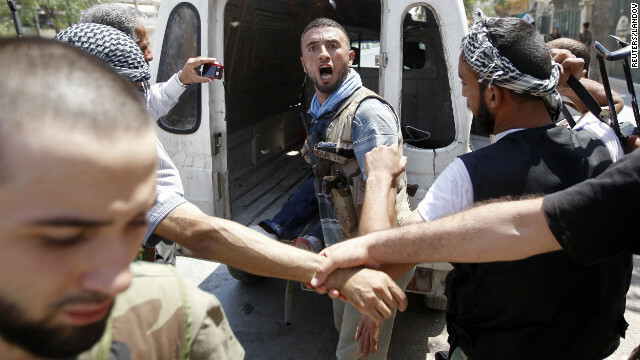 Rebel Free Syrian Army fighters capture a policeman who they allege is a "Shabiha" or pro-regime militiaman, on Tuesday, July 31, as the rebels overrun a police station in Aleppo. Rebel fighters load an anti-aircraft machine gun on an armored vehicle in Atareb, east of Syria's second-largest city, Aleppo, on Tuesday, July 31. 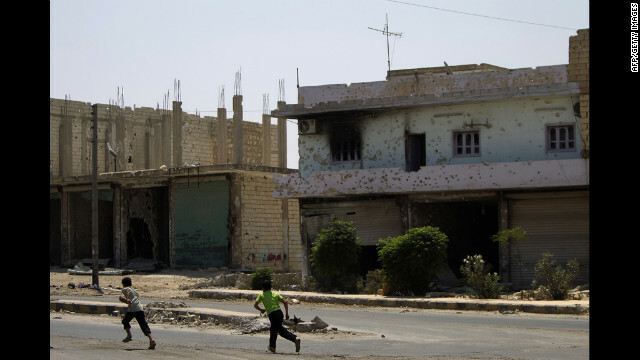 Syrian boys run near a building hit by bullets and fire in Atareb. 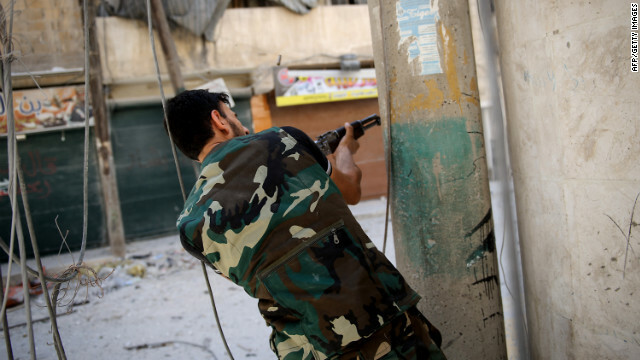 A member of the Free Syrian Army fires at forces loyal to President Bashar Al-Assad in a district of Aleppo called Salah Edinne on Tuesday. 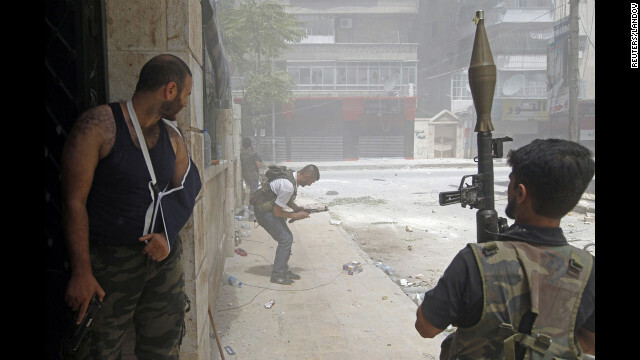 A member of the Free Syrian Army carries an injured civilian to safety in Aleppo's district of Salah Edinne on Tuesday. 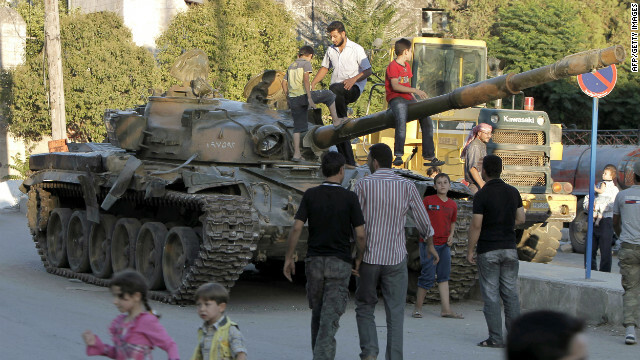 Members of the Free Syrian Army learn that a tank belonging to forces loyal to President Bashar Al-Assad is heading to the area. A Syrian boy carries bags of bread as people wait outside a bakery near Syria's second-largest city, Aleppo. 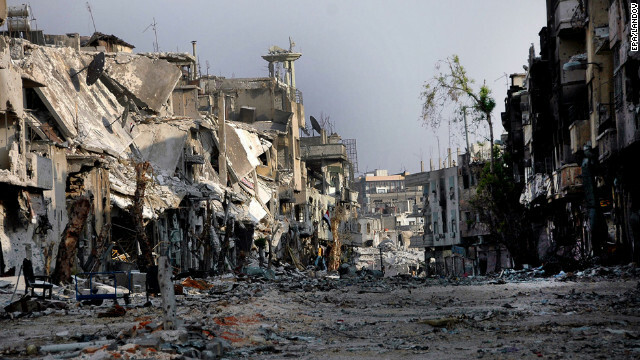 A photo released by Syrian Arab News Agency depicts damaged buildings in Homs on Monday, July 30. 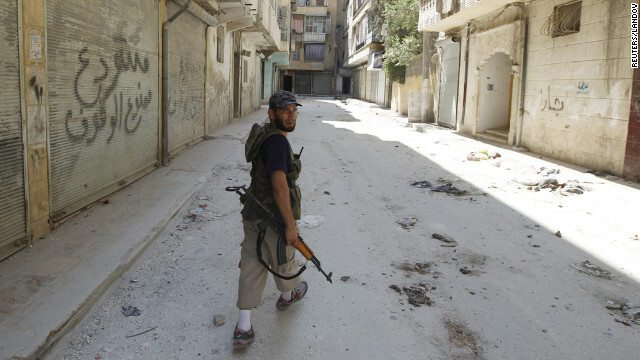 A Free Syrian Army fighter takes position Sunday, July 29, in Aleppo as people flee shelling. Intense clashes have been under way for more than a week between the regime and rebels in Aleppo, Syria's commercial and cultural center. 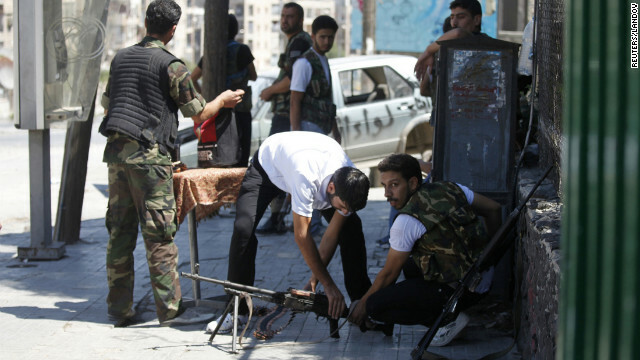 Parts of Syria's largest city saw the fiercest clashes yet in the country's 16-month crisis on Saturday, July 28. About 200,000 people have fled fighting in Aleppo and surrounding areas in the past two days, a U.N. official says. 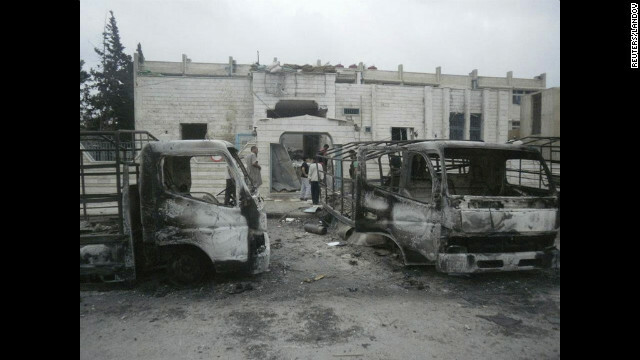 Fighting leaves vehicles damaged Saturday in the southwestern city of Daraa. 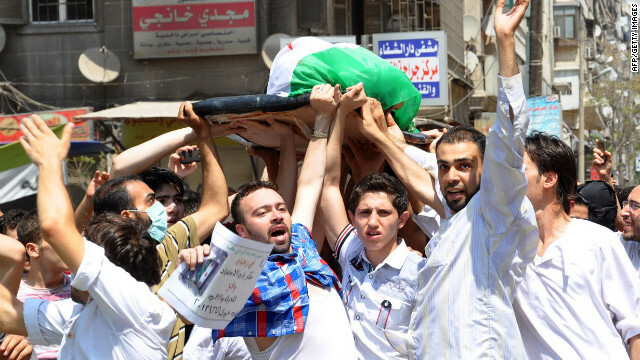 Syrians carry the body of a man allegedly killed in the bombardment of Sukari, southwest of Aleppo, by Syrian regime forces on July 27. 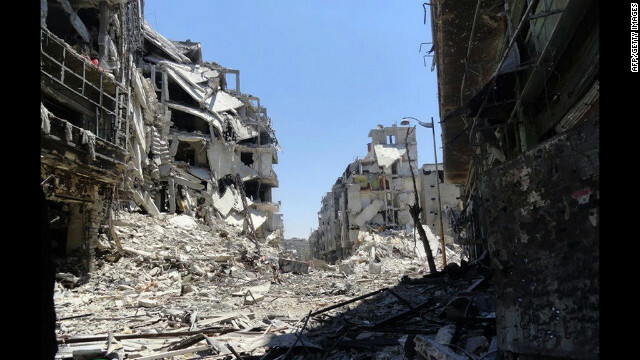 Destruction appears widespread in Homs on Friday, July 27, in a handout photo from the Syrian opposition Shaam News Network. A Syrian opposition fighter takes aim during clashes with forces loyal to President Bashar al-Assad in Aleppo on Wednesday, July 25. Family and friends mourn over the body of Usame Mircan, who they say was killed by a Syrian government sniper in Aleppo on Wednesday. 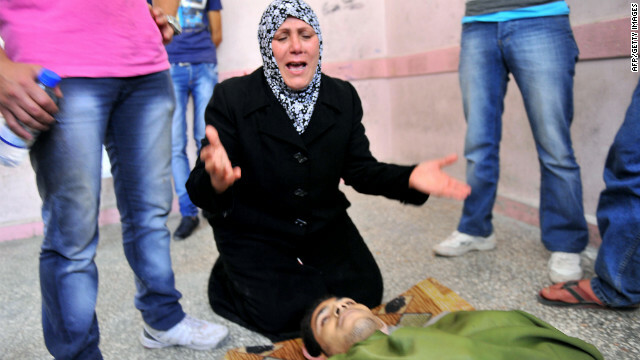 Usame Mircan's mother grieves after he was killed during fighting in Aleppo. 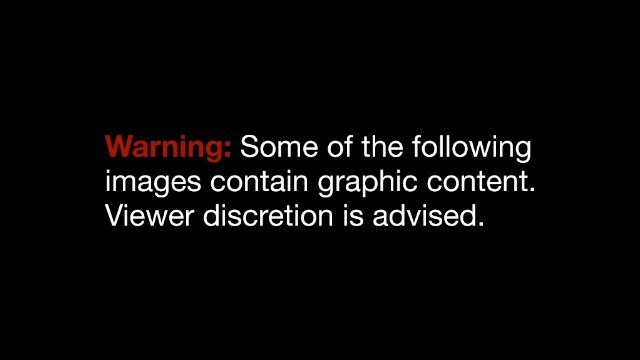 The bodies of men killed during clashes between Syrian rebel fighters and goverment forces lie on the Aleppo street on Thursday, July 26. 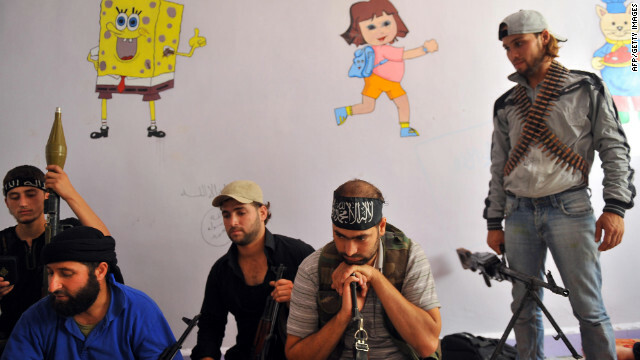 Fighters from the Syrian opposition rest at a former primary school in Aleppo on Wednesday. Residents take cover as fighters from the Syrian opposition clash with forces loyal to President Bashar al-Assad in Aleppo on Wednesday. 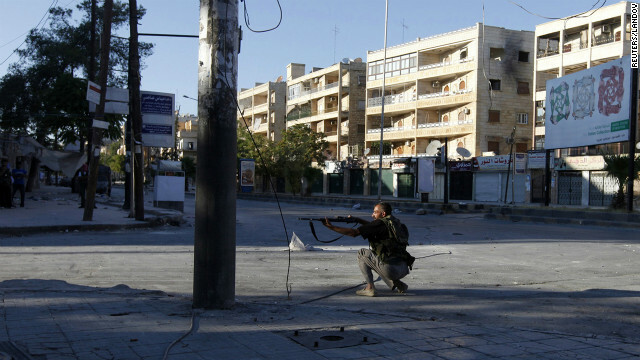 Syrian rebels guard a checkpoint in Aleppo on Wednesday. 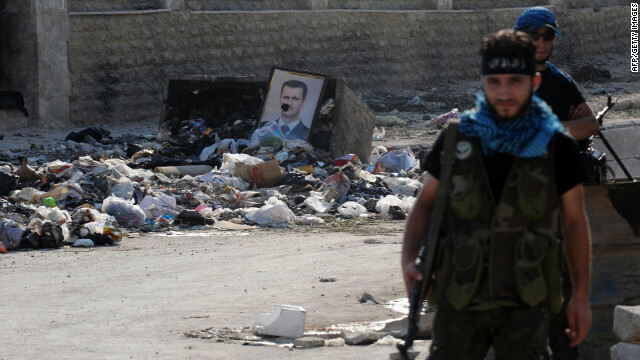 A damaged portrait of President Bashar al-Assad sits among piles of debris at a checkpoint manned by Syrian rebels in Aleppo on Wednesday. 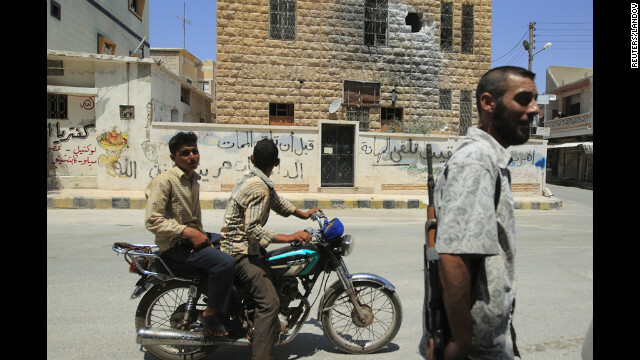 Syrian rebels drive through Selehattin near Aleppo during clashes with government forces on Monday, July 23. 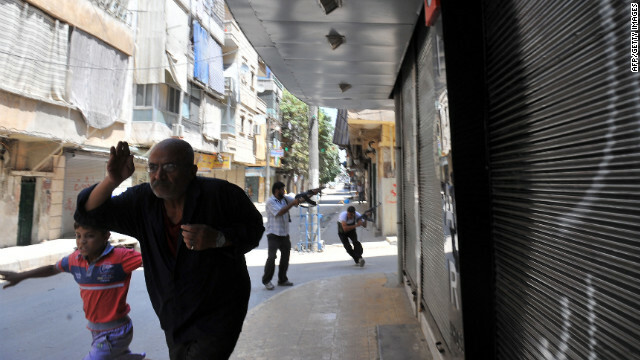 A Syrian rebel runs through the streets of Selehattin during an attack on a municipal building. 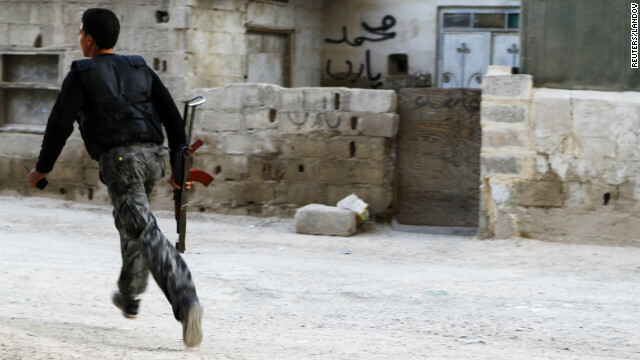 The rebel Free Syrian Army says it is attempting to "liberate" several districts of Aleppo. 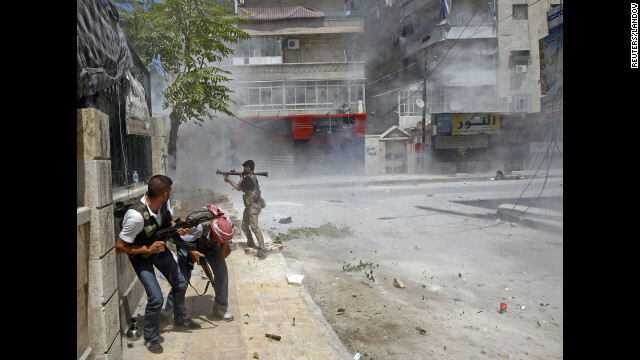 Syrian rebels work to find snipers during clashes Monday between the opposition and government forces in Selehattin. 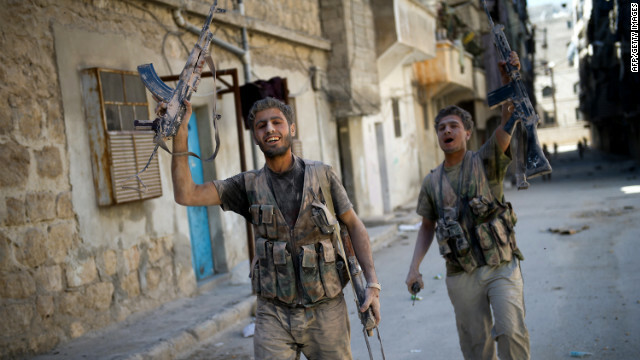 Syrian rebels make their way down a street Monday in Selehattin near Aleppo. 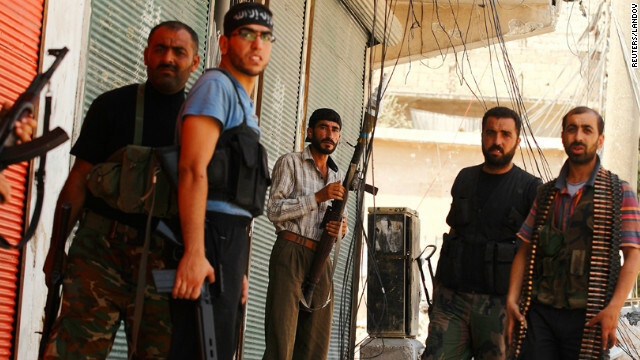 If they gain control of Aleppo, it would mark a pivotal point in the Syrian crisis. 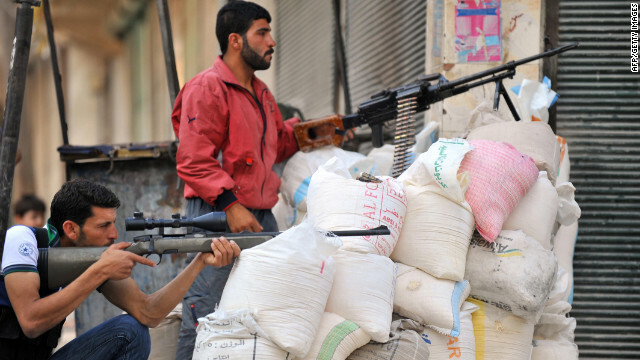 Syrian rebels take cover behind sandbags during fighting Monday at the entrance to the city of Selehattin. 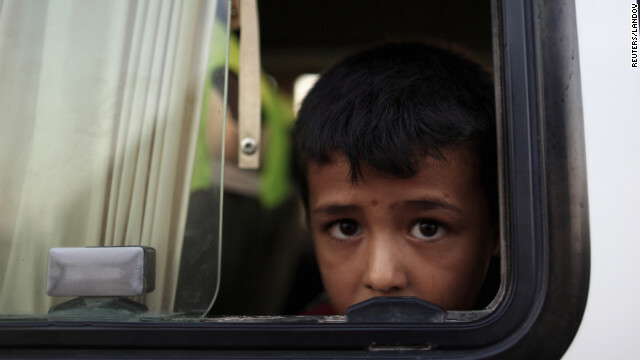 On Sunday, July 22, a Syrian refugee looks out from a bus as he arrives at a refugee camp in Turkey opposite the Syrian commercial crossing point Bab al-Hawa. Syrian refugees flee from a refugee camp nicknamed "Container City" on the Turkish-Syrian border in Kilis province, southern Turkey, on Sunday. 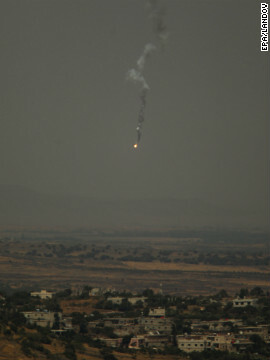 A mortar shell falls toward the Syrian village of Jbatha Al-khashab, about 45 kilometers (28 miles) south of Damascus. It's seen from the Israeli side of the border, in the Golan Heights. 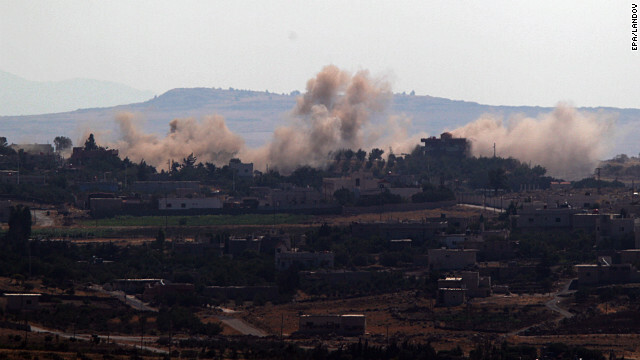 Smoke from artillery shelling rises above Jbatha Al-khashab.